I wrote this thing to be posted on Nippon.com as part of this series of articles on Yasukuni. When the Japanese document I was half-translating, half-simply-eyeballing as I put this together got tossed in the reject bin, the English went along with it . . . so here I am with a big thing to share on my own site. There may be problems with the text. The standard approach to producing content for our website is to create (or commission) a Japanese document, check it for accuracy, edit it as a piece of Japanese writing ready for publication, and then send it to the translator. The first English draft goes to a native Japanese-speaking checker, who looks at the English and Japanese side by side to spot problems that crept in at this stage. We make needed corrections and send it to another native English speaker, who edits it for style and readability. Then we turn it into HTML and find lots of other little problems to deal with. The essay below has only gone through the first translation phase, and that was done from a Japanese document that didn’t make it to the site because of all the problems in it. So I can’t promise you’re getting top-shelf stuff here. If you spot something wrong, by all means, let me know! Yasukuni Shrine, located just north of the imperial palace grounds in central Tokyo, could have been just another of Japan’s quiet Shintō facilities known as a place for New Year festivities, summer festivals, and cherry blossom viewing in the spring. Indeed, the trees that bloom in Yasukuni’s grounds are the very ones used by the Japan Meteorological Agency to declare the official opening of the blossoms in the nation’s capital. But Yasukuni is different. Each year when August rolls around, it draws major attention throughout Japan and even in other countries from watchers eager to see whether the prime minister or members of his cabinet will visit the shrine on August 15, the date of Japan’s defeat in World War II. Yasukuni was founded in 1869 as a shrine to commemorate Japan’s war dead, and today these souls number some 2.5 million, including those who perished in battles from the Boshin War—fought between the waning Tokugawa shogunate and forces seeking to restore political power to the imperial throne—up through the Pacific War. But today these war dead are held to include 14 Class A war criminals executed or imprisoned following the war, and when Japanese leaders pay their respects at the shrine, it provokes angry criticism, particularly from China and Korea. Yasukuni has thus become a divisive factor at the heart of the tangled issues of war memories, historical perceptions, and contemporary East Asian geopolitics. Below we trace the history of the shrine to paint a fuller picture of its religious, historical, and political significances. Yasukuni Shrine has its beginnings in a proposal by Takasugi Shinsaku (1839–67), a samurai who had played a key role in the 1865 civil war in the Chōshū domain that helped bring about the 1868 Meiji Restoration, for a shōkonsha—a shrine dedicated to the spirits of the war dead—to honor members of Takasugi’s Kiheitai militia who had fallen in the fighting against the pro-shogunate forces. Following the 1868 Boshin War, a ceremony took place at Edo Castle (now the site of the imperial palace) to honor the spirits of the pro-imperial forces hailing from the western Japan domains of Satsuma, Chōshū, Tosa, and Bizen. Concurrently, the souls of the lost soldiers were enshrined in the Higashiyama district of Kyoto. The aim of the shrine was originally to honor only those who had fallen in battle while fighting for the sake of the emperor. This means that famous military figures including Saigō Takamori (1828–77), killed in battle while opposing the Meiji government in the Satsuma Rebellion, and Etō Shinpei (1834–74), who had launched the Saga Rebellion in 1874, were branded as rebels and not included in the honored souls at Yasukuni. Members of the famed Byakkotai, or “White Tiger Squad,” who fought against the Meiji government in battles in the Aizu domain (today’s Fukushima Prefecture) and committed suicide when faced with inevitable defeat, have similarly been passed over for enshrinement. This does not mean that the shrine’s gōshi policy has been applied consistently through the years. Yoshida Shōin (b. 1830) and Hashimoto Sanai (b. 1834)—both executed in 1859 as part of the Ansei Purge carried out by the Tokugawa government against opponents of its trade treaties with foreign powers—are enshrined at Yasukuni, despite their deaths coming well before the Boshin War. Takasugi Shinsaku, despite dying of tuberculosis rather than in war, is also enshrined in this monument to the war dead. This inconsistent approach to candidates for gōshi inscription in the shrine’s rolls of souls has been a subject of debate—and a source of friction—right up through the inclusion of the class A war criminals in 1978. For the main part, though, Yasukuni continued in its role as a place to offer respects to those who died on behalf of Japan in its wars through the years. Their number includes not just fallen soldiers, but others held to have died in service of the empire: civilians involved in battle zone relief efforts, workers in factories producing war materiel, Japanese citizens believed to have perished in Soviet war camps following their capture in Japan’s continental holdings at the end of World War II, and crew members and evacuees killed when their vessels were sunk. From 1879 onward the shrine was under military control, with the Ministry of the Military and later the Ministry of the Interior in charge of shrine personnel decisions and the Ministry of War and Ministry of the Navy (the Imperial Japanese Army and Navy, respectively) handling all ceremonial functions. Shrine officials state that a total of nearly 2.5 million souls have been subject to gōshi over the years, as detailed in the table below. Note: Conflicts and numbers of souls are as listed in Yasukuni Shrine documents. Initially Yasukuni Shrine was conceived as a place for the repose of the souls of Japan’s war dead. As the nation went through the first Sino-Japanese War, the Russo-Japanese War, and World War I, though, the nature of the shrine shifted, and it gradually became a place to pacify the spirits of the deceased, and then to honor them publicly. During World War II in particular, Japanese soldiers would head off to battle with promises to one another to “meet again at Yasukuni.” With this, the shrine had become a spiritual touchstone for Japan’s fighting men. In the militarist atmosphere of the day, it was also defined as a place to honor the “heroic spirits” of those who had died for Japan. Following Japan’s defeat in the war, though, the victors stepped in to change this. On December 15, 1945, the Supreme Commander for Allied Powers issued the so-called Shinto Directive. This established freedom of religion and sought to sweep away vestiges of militarism by abolishing State Shinto, which had brought the native religion under control of the imperial government and made it a tool of state policy. In 1946 the newly passed Religious Corporations Law provided the basis for turning Yasukuni into an autonomous religious corporation with no ties to any state authorities. During the postwar era the shrine continued to add the souls of the dead to its rolls, performing gōshi rites to add them to the enshrined deities as new war deaths were discovered. Yasukuni Shrine attracts considerable attention today when key politicians—notably the prime minister or members of his cabinet—visit the shrine to pay their respects to the war dead. In the postwar era, this first took place on October 18, 1951, when Prime Minister Yoshida Shigeru, members of his cabinet, the speaker of the House of Representatives, and the president of the House of Councillors visited en masse to offer prayers at the Shūki Reitaisai, the autumn festival that is one of Yasukuni’s main annual events. In 1955, however, the government set forth the position that the prime minister and other ministers of state were not allowed to visit the shrine in their official capacity, as this would fall afoul of Article 20, Clause 3, of the Constitution: “The State and its organs shall refrain from religious education or any other religious activity.” The formal view on the official visits by members of the government was that while they could not be definitively described as either constitutional or unconstitutional, there was an undeniable possibility of the latter. For this reason, Japan’s government has claimed a consistent position on the matter, stating that state ministers are not to pay their respects at the shrine in an official capacity given the sensitive nature of the facility. This does not mean that ministers have followed this guideline over the years. There have been numerous visits by members of the cabinet, made in both their official and private capacities. Emperor Shōwa, meanwhile, went to Yasukuni eight times after the war ended: in 1945, four times in the 1950s, twice in the 1960s, and for the final time in 1975—the last time an emperor has visited the shrine. The nature of Yasukuni Shrine and the debate surrounding it changed considerably in 1978. On October 17, the shrine carried out gōshi procedures for 14 men who had been executed or died during imprisonment for class A war crimes as defined in Article 6 (“There must be eliminated for all time the authority and influence of those who have deceived and misled the people of Japan into embarking on world conquest . . .”) and Article 10 (“. . . stern justice shall be meted out to all war criminals . . .”) of the Potsdam Declaration, which dictated the terms for Japan’s surrender. The 14 men, convicted of war crimes by the International Military Tribunal for the Far East (the Tokyo Trials), included Tōjō Hideki, general in the Imperial Japanese Army and prime minister for much of World War II; Hirota Kōki, who served as foreign minister and prime minister during the 1930s; and Hiranuma Kiichirō, who was prime minister in 1939, as well as president of the Privy Council. Yasukuni officials described these men as “the Shōwa martyrs” in adding their names to the rolls of enshrined souls. Some of them, including Hirota, were civilians, and none of them had died during wartime, making their inclusion an exceptional case in the history of the shrine. A complex historical trail leads to the enshrinement of these war criminals. Immediately after the war, there were more than 2 million war dead who had yet to be added to the rolls. Surviving family members pressed for the gōshi rites to be applied to them, too, but the shrine cited legal difficulties in doing so due to its status as an autonomous religious corporation. It was not until the mid-1950s that the process began for these millions of souls. In 1959 Yasukuni began formal inclusion of the souls of class B and C war criminals. In the early 1970s, the shrine’s congregational congress agreed that gōshi would be undertaken for the class A war criminals as well. As shrine officials feared the impact of this move on national sentiment, however, it was postponed until 1978—and even then was not formally announced to the public until the following year. Even the inclusion of this group of 14 souls did not dissuade a number of politicians from paying their respects in person while serving as prime minister. Fukuda Takeo (in office 1976–78) and Ōhira Masayoshi (1978–80) went once each, Suzuki Zenkō (1980–82) three times, Nakasone Yasuhiro (1982–87) 10 times, Hashimoto Ryūtarō (1996–98) once, and Koizumi Jun’ichirō (2001–6) six times. Of these, Fukuda’s visit took place on the day following the gōshi rites for the class A war criminals, and he stated he was unaware of their inclusion in the shrine’s rolls. Miyazawa Kiichi (1991–93) and Abe Shinzō (during his first term in office, 2006–7) have not confirmed whether they visited the shrine while in office. There have been no imperial visits since 1975. The reason for this is generally held to be Emperor Shōwa’s displeasure at the gōshi rites for the class A war criminals. The year 1985 was one with special historical resonance for Japan, marking the fortieth anniversary of the end of World War II and the eightieth anniversary of its victory in the Russo-Japanese War. Prime Minister Nakasone’s shrine visits accordingly took on additional significance. There had been little opposition to his visits up through the one he made on April 22 that year, but on August 14, the day before he was scheduled to mark the anniversary of Japan’s defeat with prayer at Yasukuni, the Chinese government issued its first formal statement of concern about Japanese leaders’ official visits to the shrine. Nakasone went through with his visit, praying at the shrine alongside 17 members of his cabinet. This visit became a lightning rod for criticism in part because the prime minister made an offering of flowers paid for with public funds. The backlash was fierce, both in Japan and overseas, and this put an end to prime ministerial visits on August 15 for the next 21 years. Relations with China and Korea remained rocky for some time following this, a situation the ruling Liberal Democratic Party sought to assuage by convincing the shrine to undo the gōshi rites for the 14 men in question, or to enshrine them separately. Yasukuni officials rejected these suggestions, stating that once added to the pool of kami, souls could not be un-enshrined. It was in 2006 that Koizumi paid the first August 15 visit to the shrine as prime minister in more than two decades. The Chinese and Korean governments reacted with fury, with Beijing describing his visit as an “act that gravely offends the people in countries victimized by the war of aggression launched by Japanese militarists and undermines the political foundation of China-Japan relations” and Korea’s Ministry of Foreign Affairs and Trade expressing the nation’s deep disappointment and anger. Later prime ministers responded to this foreign blowback with a more ambiguous approach to worshiping at Yasukuni. During his first term in office, Abe Shinzō attended the Shunki Reitaisai (annual spring festival) in late April 2007, making an offering of a sacred sakaki tree branch and ¥50,000 of his personal money. When this came to light in the following month, though, he merely stated that he would not comment on whether he had made an offering or not. He was similarly ambiguous when asked about future plans to visit the shrine. Premiers from the Democratic Party of Japan, in power from 2009 to 2012, did not visit Yasukuni at all, although some of their cabinet ministers broke rank to pay their respects on August 15. This ambiguity has remained in effect at the top of the government, but the members of the National Diet have not felt so restricted by the prime ministers’ decisions not to go. On April 23, 2013, a total of 168 legislators from the upper and lower houses attended the Shunki Reitaisai—the first time for a group of more than 100 Diet members to visit the shrine at once since October 2005. Is there a way out of this situation for Japan? 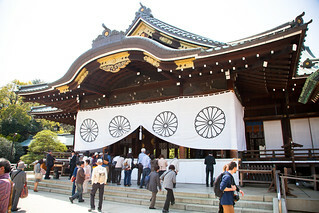 Removing the class A war criminals from the shrine’s rolls has been suggested as a possible solution to the Yasukuni problem, but the shrine has rejected this, and given the separation of state and religion, the government cannot force its hand in the matter. During the administration of Obuchi Keizō (1998–2000), Chief Cabinet Secretary Nonaka Hiromu proposed changing the shrine’s status from an autonomous religious corporation to a tokushu hōjin, or special public corporation, and then reversing the gōshi of the 14 problematic souls. This plan, too, fell by the wayside. Another proposal is to construct a secular, national war memorial facility where public figures can pay their respects to the war dead without controversy, but this has not happened either. In 2001, under Prime Minister Koizumi, the Advisory Group to Consider a Memorial Facility for Remembering the Dead and Praying for Peace began discussions, in the following year issuing a report [which I translated, I think] stating that “a national, nonreligious, and permanent facility where the nation as a whole can remember the dead and pray for peace is necessary.” Work never moved forward on such a facility, though. People around the world have places where they can offer their respects to those who died in the service of their country, such as Arlington National Cemetery in the United States. Japan does have the Chidorigafuchi National Cemetery, located near Yasukuni, but this is a place to house the remains of the unknown Japanese war dead, including civilians as well as military and support personnel. The country has no state-managed facility for paying respects to its fallen soldiers.